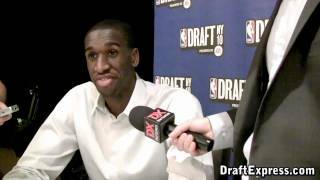 Ekpe Udoh, the #6 pick in the 2010 NBA Draft, switched, slid, stripped, contested, recovered, rotated and swatted Fenerbahce to a 2017 Euroleague Final Four title, the Turkish power's first in club history. Written off as a 'bust' relative to his lofty draft status and just-decent NBA production (10.8 PER in 274 games played over five seasons), the recently turned 30-year-old Udoh thoroughly dominated the Euroleague Final Four with his stout, versatile defense, putting the clamps on Greek legend and three time Euroleague Final Four MVP Vassilis Spanoulis, one game after neutralizing incumbent Euroleague MVP Sergio Llull (the 34th overall pick in 2009). Thanks to his excellent feet, massive 7' 4.5 wingspan, sharp timing and overall defensive range, Udoh killed nearly every ball screen with his 'switchability', stalling Olympiacos' offense. His dominant defensive performance (seven blocks in 75 Euroleague Final Four minutes) begs the question - why didn't Udoh stick in the NBA? The former Michigan big turned Baylor transfer certainly could have done more to maximize his opportunities at the NBA level, but the league had yet to evolve into what it is today. At 6-10, Udoh was 'undersized' for a center, and didn't quite have the skill set to fit as a four man, evident by his porous 8.9 points per 40 minutes on 44% shooting as a rookie in Golden State. With post touches more prevalent, Udoh didn't exactly fit on either end - undersized as a defender on the block, and raw as an interior scorer. His toughness was also questioned, and his lack of defensive rebounding was worrisome in a league that played bigger, and wasn't nearly as switch-heavy as it is today. But since his underwhelming seasons with the Warriors (2010-12), Bucks (2012-14) and Clippers (2014-15), the NBA has trended back in Udoh's direction. He's without question a five in today's NBA, and his perimeter defense and shot blocking instincts are as valuable as ever. Spanoulis, who shot 2-for-12 from the field largely due to Udoh's stifling perimeter defense, definitely isn't Steph Curry, Chris Paul or Kyrie Irving, but Udoh fits a prototype that all teams are looking for, and would most definitely be a defensive asset on virtually any NBA team today. More than anything, Udoh's Euroleague Final Four dominance emphasized the importance of having a big who can switch ball screens when involved in pick and roll, and put a lid on the rim when he's in help position. His much-improved passing is certainly an added bonus (3.0 assists per 40 minutes this past season), but it's his ability to switch, guard either big spot, and protect the rim that make him an attractive option for a team looking to bring him back over, although after his now-legendary weekend in Istanbul, he likely wouldn't come on the cheap. Transferring schools might become all the rage pretty soon, if the success that Wesley Johnson at Syracuse and Ekpe Udoh at Baylor are having thus far is any indication. Udoh took one look at then-incoming head coach John Beileins methodical, perimeter oriented Princeton-type offense and decided it wasnt for him, eventually leaving Michigan for the greener pastures of Baylor. Based off what weve seen thus far, he seems to have made a very good decision for himself. Not only is he being heavily featured in Baylors offense, but he appears to have improved his skill-set significantly in the red-shirt year he was forced to sit out. Udoh is still the same long, broad-shouldered and athletic big man he was at Michigan, but he now is looking more and more like a true power forward. He sees plenty of touches both facing and with his back to the basket, looking fairly comfortable either way creating shots for himself. In the post, Udoh has a very nice jump-hook he likes to turn to, even if he doesnt always have enough girth to establish great position down low. Hes an excellent finisher as well, shooting 66% from the field on the season so far. The place that he shows even more intrigue is on the perimeter, as he appears to have improved his footwork and shooting touch quite a bit, and has become much more effective attacking defenses off the dribble. Baylor likes to isolate him about 15-17 feet away from the basket and let him go to work, asking him to create his own shot in pure one on one situations. This is something you dont see all that much at the college level, particularly not with big men. Udoh shows a solid first step and intriguing footwork here, usually pivoting or spinning his way into the paint, and often converting impressively. This is obviously a part of his game that has potential. Hes not immune to turning the ball over in these situationseither by picking up his pivot foot too quickly on his initial attack or by trying to execute too complicated a move once hes inside the paint. His balance doesnt seem to be all that great and he has trouble finishing through contact at times, but its nonetheless intriguing to see a 6-10 player flash these kinds of skills. Udoh has also knocked down three of his six 3-point attempts on the season thus far in seven games, showing solid form and nice touch. He also made a number of mid-range jumpers in the film we took in, indicating that this isnt a fluke and hes indeed improved this part of his game. On the downside, hes only made 42% of his free throws on the season, which is obviously something that needs serious work. Nonetheless, if he can continue to establish himself as a legit floor-spacer as the season moves on, his stock will certainly rise with all the other things he brings to the table. With his outstanding length, good size and solid athleticism, Udoh has all the tools necessary to be a very valuable contributor on the NBA level as both a defender and rebounder. So far this season hes putting them to good use, averaging 9.3 rebounds and 3.6 blocks. His timing appears to be solid, and he does a terrific job using his long wingspan to contest shots. Baylor plays quite a bit of zone, and with Udoh manning the 4-spot we get a decent amount of opportunities to see him step out onto the perimeter, where he shows pretty good feet. He seems to have good potential as a pick and roll defender, although at the moment it appears that his fundamentals arent always the best. He gives up post position too easily at times and tends to get backed down in the post, not always having the bulk to fight back against stronger opponents. Udoh also seems to lose some focus and intensity defending off the ball, although part of this may be attributed to his conditioning, which appears to be a work in progress coming off an 18-month absence from competitive play. Adding strength and gaining experience will only make Udoh more effective on this end of the floor, as there is no question that he can develop into a very solid defender and rebounder in the NBA in time, which even without his budding offensive skills would already make him a solid rotation candidate. Right now Udoh doesnt seem to be on anyones radar screen, as hes receiving virtually no attention from the national media or the other NBA draft outlets. Expect that to change pretty soon, as its only a matter of time until people take notice of how much Udoh has improved. Comparing his last season at Michigan with what hes done so far at Baylor, on a per-minute basis, Udoh has more than doubled his scoring rate, improved his field goal percentage from 44% to 62%, upped his rebounding, assists and free throw attempts considerably, maintained his shot-blocking production, and reduced his fouls dramatically. Its possible that we've yet to see the best of him just yet as well, as most players tend to take some time to shake off the rust after sitting out an entire season the way Udoh was forced to last year. Watching him play, its tough not to think about the way Jordan Hill rocketed up draft boards right around the same time last year. Udoh might not be quite as explosive as Hill, but hes got excellent physical attributes in his own right and is much more polished on both ends of the floor. Only 7 games into the season, it may still a bit early to be jumping to too many conclusions, but there are surely plenty of reasons for Baylor fans and NBA scouts alike to be excited about what Udoh is showing thus far. A raw, but intriguing big man, Ekpe Udoh was the third post player in the lineup for Michigan during his freshman season, and showed nice flashes of potential against Big Ten competition. This season, he will be more heavily relied on by new head coach John Beilein, on a Michigan team that will look much different from last season. Udoh can be labeled as a project for the time being, but has the raw tools to attract attention from scouts at the next level. Udohs intrigue as a prospect starts with his promising shot-blocking ability. During his freshman campaign he averaged 4 blocks per 40 minutes (pace adjusted), ranking him 10th in the country amongst returning draft prospects. The sophomore big has a monster wing-span, and shows good anticipation both on the ball and coming from the weak-side. The talented big man can block shots with either hand, and avoids foul trouble surprisingly well for a young shot-blocker. Offensively, Udoh remains raw, but can step out and hit the mid-range jumper with decent consistency. He lost confidence with his jumper during some portions of his freshman season, but shot the ball more accurately as he adjusted to more playing time later in the season. From the low block, Udoh has yet to become a scoring threat due to his lack of strength. In addition, better footwork will be a necessity for him to develop a back to the basket game. Udoh did show a little potential shooting a hook shot last season with both hands. Unfortunately, he really lacked touch on this shot, and sometimes resorted to turning and wildly releasing it, without gaining the proper position first. Udoh must really focus on increasing his strength over the next couple of seasons. The lack of strength hurts him badly on the defensive glass, where he often loses the inside position to stronger players. He does rebound the ball effectively on the offensive end, showing good hands to compliment his terrific wingspan. A better body will allow Udoh to finish strong inside, rather than shying away from contact like he did last season. Ekpe Udoh has the tools to make it to the NBA down the road, but he still remains a raw prospect at this point. Over the next couple of seasons, he must focus on becoming stronger while further developing his offensive game. It will be interesting to gauge the progress he makes this season playing against Big Ten competition, though it is likely that Udoh will have to stay at least a few more years at Michigan, depending on how long it takes him to add bulk and polish up his skill-set.